The name 'Rodrigue' is a common one in Cajun country. However, outside the southern part of his home state, George Rodrigue endures miss-pronunciations and miss-spellings on a regular basis. 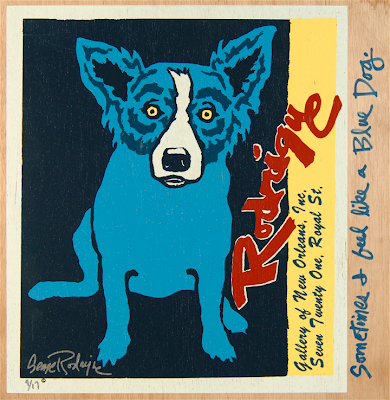 In 1972 George received a letter from a Canadian professor asking about the Rodrigue name. He had read about George in an art magazine, as a painter of Cajun folk life. It turns out that this man held the rest of the puzzle, having traced the Rodrigue name (or Rodrigues before the move) from Portugal to Beauport, Canada. He knew of four Rodrigue brothers leaving Canada in 1755, but knew no further. George put him in touch with Bertha, and they connected the dots. George uses his name as both a symbol and an interesting graphic element. This is especially true of his Louisiana commemorative posters, when he breaks up the plain but necessary border text with a large and bold signature. 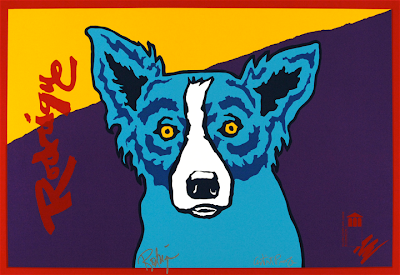 With the Blue Dog Series, specifically the original silkscreens, in numerous cases George incorporates his name as a design element, sometimes so strong that it competes with the Blue Dog for attention. And so there you have it, the name 'Rodrigue' (pronounced ‘Rod-reeg’), with a bit of genealogical lagniappe thrown in. 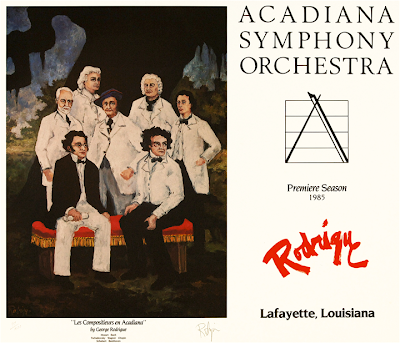 *For more on the Acadian exile of 1755, visit A History of Evangeline in Rodrigue Paintings and The Saga of the Acadians. For more on the French people in Louisiana see The Aioli Dinner and a Cajun Artist. For more on George’s parents and childhood see the story How Baby George Became an Artist. For more on Aunt Bertha the Old Maid, as she was known to the family, see the story Tombs in the Life and Art of George Rodrigue. Fewf! Great post and informative... feel I am always saying it wrong.. Yay! Wendy, I want to thank you ever so much for this blog! 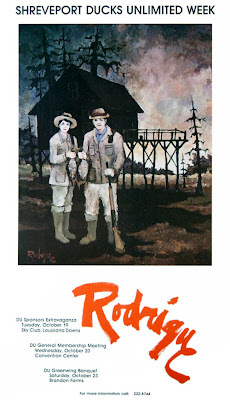 I am also a Rodrigue, although as my family are Quebequois and not Cajun, we pronounce it ROD-rig, sometimes RO-djrig (or if we are speaking French RUD-RIG with the rolling r). I grew up in South Florida, where inevitably the ending "z" was tacked on without my consent. And I have countless times corrected people "no, it's French, not Spanish" without bothering to delve into its Portugese origin. "Say it like there are no vowels at the end" was my helpful tip. I first came to know of George's work through the Absolut ad in the early 90s. It was the first time in my life I had seen my last name in print spelled correctly! It was a magical moment for me, one that legitimized what had been a source of embarrassment. I tore the ad out of the magazine and now have it framed and prominently displayed in my living room. I have admired your husband's work ever since. While growing up, I couldn't wait to get married and be rid of this name that nobody can spell or pronounce. But in my bloodline, there are only three remaining Rodrigues (plural, not with an "s"). I am one of them. The older I get, the more determined I am to hang on to this name, this heritage, this source of great pride. Wow, a real reunion of Rodrigue's!!! I've been following George's art for a few years as I've been building my own art career, but am full of joy to have come across this post! I'm a decendant of Sebastiao Rodrigues, and I do believe we had some move on to l'Acadie, but my grandfather came over to the province of Ontario from Saint Clet, Québec, which has now been absorbed into Montréal. I wonder how many more of us have artistic genes? Bon Jour..i am a RODRIGUE of Canadien descent living in MA. when people want to put an "S" on the end of my name i always answer that "We drop the "S" in 1665. Which gives them the extent of my immigration and genealogical status. Hi Mrs. Rodrigue, I just heard about your husband on Auction Hunters and leaped on the internet to find out more. I am also a Rodrigue and still live in the province of Quebec. Our line is from Jao Rodrigues from Portugal but that is about all I know so I will be going to the link you gave. 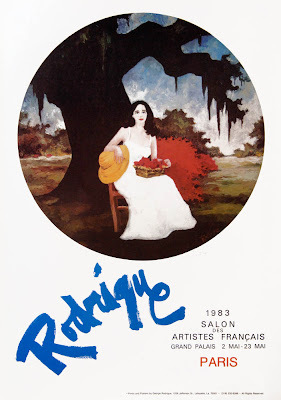 I love Mr. Rodrigue's earlier work, trying to find a poster reproduction to hang in my home. Hi Stephanie, Thank you for your email. Yes, I can see where George's Cajun paintings especially might resonate for you. 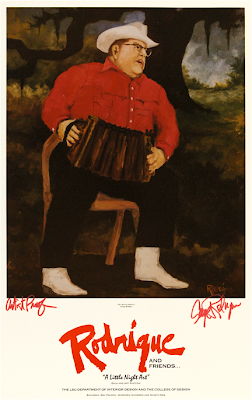 There are lots of Cajun posters available by contacting the Rodrigue Gallery info@georgerodrigue.com. I read George your comments and he was intrigued to find another Rodrigue cousin - living in Quebec and discovered through Auction Hunters at that! Hi Wendy! Thank you for this blog post. Like my sister Linda commented on March 6, 2010, my sisters and I shared the same pronunciation issues growing up that you describe in your blog entry. Linda did a great job of exposing our entire family to George Rodrigue and the Blue Dog before her untimely death in September at the age of 41. Thanks to your blog and her comment (which I only discovered this evening), I can read in Linda's own words why she was so fascinated by the Blue Dog. By the way, even after getting married last year, she kept the Rodrigue name and made it her legal middle name. I am truly saddened to hear this about your sister Linda. George and I both send our deepest condolences on the loss of this young life, someone obviously so special to you and your family -- to the 'Rodrigue' family. I think it was a wonderfully informative and interesting post! Not dry at all. THANK YOU for sharing the information and history. I am a RODRIGUEZ, and I always wondered. 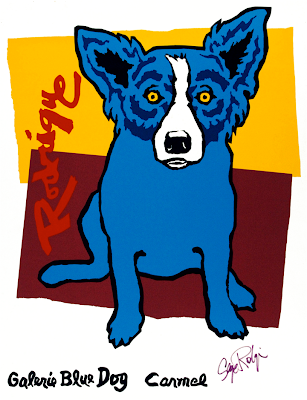 I have been following Rodrige's art for years and love the Blue Dog. It is a very wonderful thing to be in touch with one's heritage and have such pride! Keep up the terrific posts! I love reading them and learning about the art and the man, and the author! Cheers, Wendy. You're a very good writer. I am a Rodrigue. I was born in Lewiston, Maine where there are a lot of French Canadians who came to live. 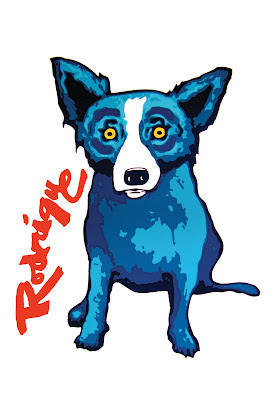 About 10 years ago, my cousin briefed me on his line study of Rodrigue. He stated we derived from Portugal, went to Canada and some went from Canada to Louisiana. He also stated that there were a lot of artists in the Rodrigue family. It seems that the Rodrigue blood has developed a line of people who definitely think out of the box. Most of us seem to be well rounded and have the same energies. In no matter what we do, we like to research, discover, develop, create and succeed. We are very independent and self driven people. Many of us tend to be self employed. 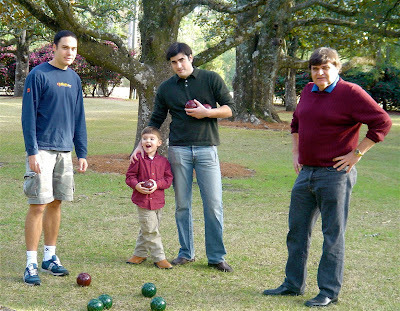 I am very proud to be a Rodrigue. And yes, the pronunciation has been an issue. Your comments are a great addition to the post, Anon. Thank you! Not a dry post at all!!!! I have recently begun researching my family history on Ancestry.com and have reached a wall with my maternal great grandmother! I am told by "old-timers" in the family that her maiden name was Rodrigue before she married my great-grandfather, Albert Hebert. She was Zoe Rodrigue. They all lived in Southern Louisiana before moving to Orange, Texas. I will research these four Rodrigues and see if that gets me anywhere! Wendy, my mother Eunice Rodrigue was first cousin to George, an her sister Berths ( Aunt Bertie ) as I called her came up with the family tree you are mentioning. I have a original hanging in my house!! Very much proud of my heritage. My name is Elaine Landry. My name is Elaine Landry (mawmaw). My mother was Eunice Rodrigue, she was sister to Bertha who did the research of our heritage. I am a direct descendent of Jean Baptiste Rodrigue who served with the LA militia and thus qualifies me for DAR! Actually Caesaire Trosclair is my Facebook nom de plume. This website gives a different version of this name. Thank you for the link. I don't see anything different here, but all input is much appreciated. Rodrigue here, descendant from the great French Canadians. The name pronunciations part made me laugh. I live in San Diego and everyone wants to add a Z and change my heritage. I was excited to see this blog, albeit late, Wendy. One of my many greats grandmother was Mathilde "Martine" Roderique (or Roderigue) born in Beauceville, Quebec 12/23/1824 and married to John (Jean) Baptiste Gagnon also of Beauceville b. 2/5/1811. They immigrated to Waterville, Maine and the officials changed their name from Gagnon to Goodno, which I wondered was a slur at the time (no good, good no?) Other family names included LaTulippe (or LaTulipe) and Garant (or Garrand). I couldn't trace back any further although I thought the LaTulippe branch may have descended from Antoine Chantelois dit Latulipe and Ursule Chantelois Poirier Desloges of Overne, France, his birth in 1740 and hers in 1746. Anyway, fascinating to try to track back and excited there is a Roderigue reunion in LA. Love George's work. If anyone has more information or corrections, would love to hear. I am a Rodrigue also from Lousiana. My grandfather is from Chack Bay, also my great grand parents are buried there too. I have been to many of the reunions down the bayou. Your late husband and my late father are related some how, I do not remember. We do not have much on the geneology of our family. My late Aunt who married my fathers brother did lots of research. But when she passed her son threw everything away. I would love to chat with you if you are ever down in New Orleans. My email is beckyr02@yahoo.com. I have been a fan of your husbands work for a very long time. I'm a descendant of Jean Rodrigue, and it's intriguing that someone from Portugal immigrated to Quebec. I would love to know the haplogroup for any male Rodrigues. There has been some speculation that he and his wife Susanna de la Cruz were conversos, and it would be interesting to know the male haplogroup. I am also a descendant of Jean out of Quebec. Our haplogroup is E-M35 also known as E-L29. As for conversos, it's very posible as i was given 5% Ashkenazi. Sorry I have not been pronouncing Rodrigue correctly. I have loved Blue Dog since my friend gave me the Neiman Marcus catalog featuring Blue dog on the front and back covers. I have had terriers for many years and Blue Dog stole my heart forever.